More importantly, was your dad even slightly impressed with your access to the John Russell history? He was happy to learn all of that, and he was happy when I put my phone down. We used to watch that station all the time, but we lost it when our cable company dropped it. But there are lots of old westerns on other channels. 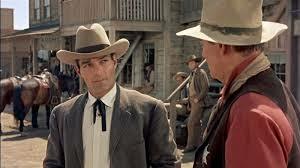 Clint Walker did other westerns but that was pretty much his professional peak. The show had a interesting back story, but they never really developed it. As I wrote, I have watched a ton of Western movies and shows, but that one slipped by. I am not sure why. Naturally I remember him from The Lawman tv show. He looks almost exactly the same in Pale Rider – with his mustache. Which is kinda funny because you’re used to seeing him being a goodguy. But when he wasn’t wearing a mustache you could still recognize his distinctive voice. When an actor’s Star falls I sometimes have sympathy for them, because it can be tough business getting work. I don’t know he did after The Lawman? Some actors get tons of work – even when they aren’t Stars any more. Guys like Matt Clark, for instance, actually get more work that the Stars – just less pay. I hope there’s enough money and work to go around … but I doubt it. I have never seen The Lawman, either. People who watch that show see him as a good guy. Most things I have seen have him as the bad guy. Therefore, I cannot help but think of him that way. I just looked him up on IMDB. He looks a bit like Omar Sharif here. There are some similarities. Safe to say that Omar went on to greater fame.